Each piece starts out as 110 lb cardstock paper. I personally use both Legal size paper, as well as standard size. Legal size paper allows you to fit more pieces on each page, just make sure you adjust your printer options for it. In my opinion, the hardest part of this entire phase is scaling the piece to fit you. I had to remake several pieces to get the right fit. Even when you measure a piece and it fits you, it may not fit as well on you with the other pieces. I ended up remaking my shoulders several times since they not only had to fit my arm, but fit well with the chest piece. Once you have your models, the next step is to harden your paper. There are several different methods, but one of the most common is using Fiberglass resin. Always wear a respirator when using Fiberglass resin! It is very toxic! You’ll need a work space in a ventilated area. When applying your first coat of resin to your paper, use a very light, thin layer. Fiberglass resin is very heavy and if you put too much, you may warp your model. Once a base layer is on and has some rigidity, then you can start adding more layers. Each piece can have 2 to 3 layers of fiberglass resin, sometimes more if places on your model feel weak. Add fiberglass cloth to the inside of your model once it has some strength. You can use spray adhesive, or Elmer’s glue to hold it in place while you apply a layer of fiberglass resin to it. When applying your resin, make sure to watch for drips. It’s not a big deal because they can be sanded off, but it is much easier to wipe them away when they are still liquid so you have less work to do in the long run. Add a layer of primer to your piece so you can see all of the flaws. I prefer to use gray primer, but any color will do. Once you can see all the bumps, start sanding to get your piece as smooth as possible. Use a palm sander where you can, you’ll mostly have to sand by hand to get into the nooks and crannies of each piece. Not every piece may need bondo, but areas that need to be rounded or smoothed out can have Bondo added to them. Add thin layers of bondo, sand each layer to smooth, add small amounts to fill in holes and voids and to build up the sections you need to. There is a lot of sanding to be done at this point. Use a dremel sanding drum on the drips and big bumps. Use the diamond cutting wheel to cut your fiberglass. You’ll need to split the chest, and cut out the visor on your helmet. You may also need to cut your shins/gauntlets in half in order to put them on. Test fit your visor to see where you’ll need to drill holes in your visor. Mark in your helmet where your screws will be glued in, and mark on your visor where the chicago screws will be inserted. Use the epoxy to glue the base of the chicago screw onto the wooden piece (cut small wooden squares slightly larger than the screw base). Let them dry over night. Once those are dry, you can glue the wood into your helmet. Make sure to score or sand the fiberglass in your helmet where they will be glued, the glue needs some texture to grab onto. Drill a hole in your visor slightly larger than your chicago screws. Then insert your helmet onto the screw posts and then screw them into place. You can remove your visor when needed with this method! Apply thin layers of paint to your pieces. You may need several layers to get a good coating. Start with the green first. Use the flat black to do a black wash. Spray the black onto your piece, wait a second or two, then wipe it away with a rag or paper towel. Leave some black in the crevices, and areas where dirt would accumulate. You want to try and make it look like this armor has been used in the field! Once the blackwash is finished, then you can apply the chrome to create a weathered effect. Spray the chrome onto the paintbrush and lightly tap the brush onto the edges of your piece to simulate scratches, and wear and tear. Use EVA foam for the lining of the pieces you’ll need. Each piece will need to be custom fitted for your body. Some pieces may need a lot, some might just need a small square or two just to keep it in place. I also used the EVA foam for the lining of my helmet. Use the nylon straps to hold your shoulder pieces to your chest plate. Strap your thighs to the belt to hold them up. Use the buckles to attach your chest pieces together. This is the basic bare bones of how to create this armor. 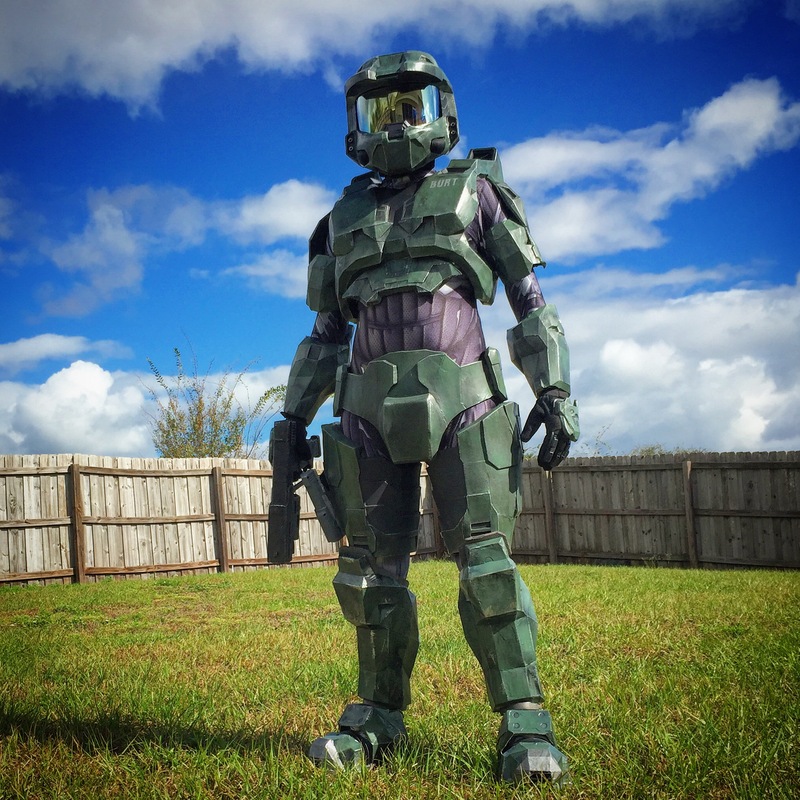 I learned everything from the 405th.com, a Halo costuming community. There are many ways to create armor, but this is the method I used for mine. There are much better methods for different parts of the suit, but do what works best for you. I am constantly upgrading my pieces and learning new methods every single day and there isn’t one ‘best’ way for anything (there are definitely easier methods for different things though!). Each time you make a piece, you learn and get better. I made this in hope to inspire others to create what they’ve always wanted. This suit has been a dream of mine since I was a kid when Halo:Combat Evolved was first released. I was able to create my suit in a months time, but this is highly unusual. Some folks take several months, to several years to build a suit. Take your time, learn from your mistakes, and as always, keep building! If you have any questions regarding my suit, or need any tips and advice I haven’t covered here, please feel free to contact me. I would love to help any way I can.